Throughout Norman Osborn's Dark Reign he committed some really heinous acts but few compared to what he did to his own son, Harry. To recap, Norman recruited Harry to join his Avenger's team (as the aptly named American Son) whilst secretly plotting to use his son as a martyr to strengthen the Iron Patriot's crusade. Moreover, Harry was manipulated to join Norman by his ex-girlfriend, Lily Hollister, who claimed she was pregnant with his child. Harry, feeling obliged to protect his unborn son, accepted his father's proposal as a means to an end...and that end was to rescue Lily and 'cure' her of her Goblinized-persona, Menace. With Osborn incarcerated, his enemies plotted against him. In Amazing Spider-Man #642, Dr. Octopus gathered a crowd of Spider-Man's foes at an abandoned Kravinoff Estate in upstate New York. He offered them an 'unparalleled reward' for the retrieval of an 'item'...the villains sped off in hot pursuit. Meanwhile at the Coffee Bean, M.J. entertained Peter, Harry and Carlie Cooper with embarrassing stories from Peter's past; luckily for him something much more offensive came crashing through the shop windows...a pregnant Lily Hollister! In fact Lily was about to give birth and she was looking for Harry, the only problem was that the Shocker and Tombstone were right on her tail. It soon became apparent that Doc Ock's item of interest was Lily's newborn son. Harry had not seen her since she had disappeared with Norman during his run as the Iron Patriot, but he still felt obliged to help her. However, before Peter or Harry could help deliver the child, Doctor Octopus arrived at the Coffee Bean and delivered the latest male-Osborn! Spider-Man quickly recognized that the arms of Doctor Octopus was no place for a child, so he snatched the young Osborn at the beginning of Amazing Spider-Man #643. Spidey fled the scene with police in-pursuit, making him a wanted man by both the good guys AND the bad guys. Lily, who had passed out during the birthing process, awoke only to find that her baby was missing. 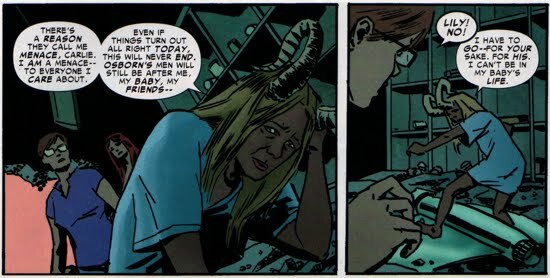 After M.J. and Harry told her that the baby was with Spider-Man, Lily claimed that she could not be taken to a hospital (she must be kept hidden) because the people that Norman has 'following [her]' will come to kill her. She also claimed that Norman had her in a cell, from which she broke out to deliver the child. Harry and M.J. move fast to get Lily out of the public spectre and they take her to the panic room of M.J.'s producer, Shelly Hatton. Interestingly Carlie turned her back on helping her (former) close-friend, claiming her to be a murderer. The web-slinger's chase through the streets of New York became a televised event and eventually Homeland Security agents arrived (at the President's request) to aid Mayor Jameson in the effort. The agents told Jameson that "even imprisoned, Norman Osborn is still considered one of [the] country's most dangerous felons" and they believed that this child was Norman's offspring. In Amazing Spider-Man #644, women were coming from out of the woodwork claiming the child, a fact that muddied the police's ability to decipher who the child belonged to (although the feds seemed to have it figured out). Moreover, when the police questioned Carlie Cooper as to the nature of suspects she gave them no information, this helped to insulate Lily Hollister from trouble. Eventually Doc Ock sent out the Chameleon, who in turn approached Spidey disguised as Harry Osborn. Spidey inadvertently handed the baby over to Chameleon (fooled by the disguise) and the Chameleon-Harry told Spidey that the baby was dead...this enraged the web-slinger! Spider-Man then went out an war-path, bringing in every villain he can get his hands on (from D-Listers to A-Listers) in Amazing Spider-Man #645. Back at the Kravinoff estate during a conversation with the Chameleon, Dr. Octopus explained his rationale for wanting access to Norman Osborn's child (see below). Meanwhile, Harry Osborn decided to take matters into his own hands to protect Lily and the child; and to do so he returned to a Green Goblin Hideout. Harry considered 'redosing' with Goblin Formula (should he really need to do that? Isn't the rule once Goblinized, always a Goblin??). Spider-Man eventually tracked down The Enforcers, Shocker, and the Sandman; and after nearly killing them he was able to get the information he wanted...that the mastermind (aka Dr. Octopus) was at the Kravinoff estate! Spidey raced to the estate and found the Chameleon who quickly, and cowardly, gave up the information that the baby was still alive and was now in the possession of the Lizard (aka Curt Connors)! 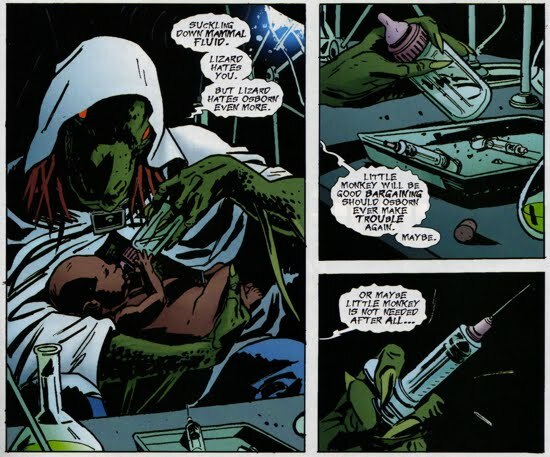 The Lizard divulged an interesting fact whilst feeding the infant Osborn in Amazing Spider-Man #646. He mentioned that he hates [Norman] Osborn and that he was interested in keeping the baby as a bargaining chip against him. Spidey and Doc Ock crossed paths en route to the Lizard and the two decided to work together to find the baby under the premise that "if Norman Osborn's baby dies, [they] both lose". Eventually they found the Lizard who suddenly had no interest in the baby, this left Spider-Man confused. After running a few tests in the Lizard's makeshift underground lab, Spidey deduced that the baby was not Norman Osborn's (the newborn lacked a distinct chemical signature). 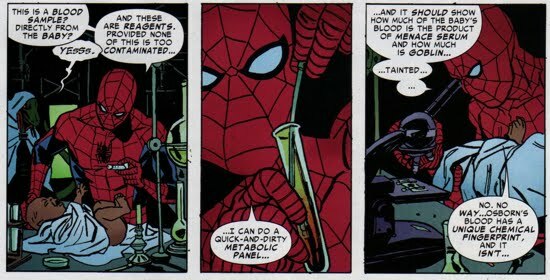 Spidey took the baby and left Ock with a blood sample as proof that the baby is not a 'biological singularity'. Back at Hatton's (now destroyed) panic room, Lily decided that she was not fit to be a mother and that the baby's life would always be in jeopardy because Osborn's men will relentlessly search for them. She then hopped on her Goblin Glider and flew off into the night before Harry could talk to her. Soon after, Spider-Man sent a message (via M.J.) to Harry telling him to meet Spidey at Avenger's Tower. Using the sophisticated technology at Avenger's Tower Peter was able to confirm that Norman Osborn was not the father of the child, rather, it was Harry Osborn (a fact that Peter claimed Lily did not know for sure)! Harry appeared relieved and he confided in Spidey telling him that he (Harry) always wanted it to be true. 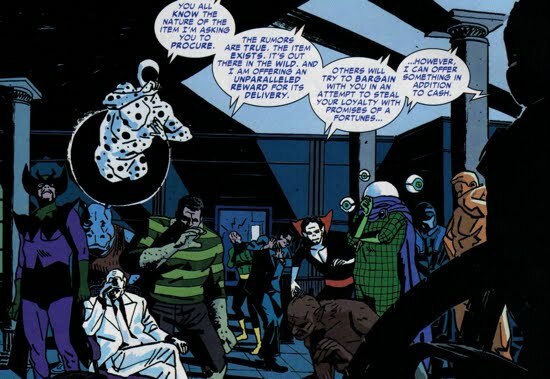 The story arc officially concluded in Amazing Spider-Man #647 at a Halloween/going away party for Harry and Stanley Osborn. Harry told Peter to get the message to Spider-Man that he (Harry) and the web-slinger were 'square'...no more vendetta, no more blaming the web-head for his own problems. Harry decided to lay-low and move away from NYC in order to raise Stanley. An interesting side-bar conversation occurs between Harry and Vin Gonzalez, to find out what happened check here. Parting Thoughts: Not to be a spoil-sport, but it seems to me the entire premise behind the Origin of the Species story arc was inherently flawed. 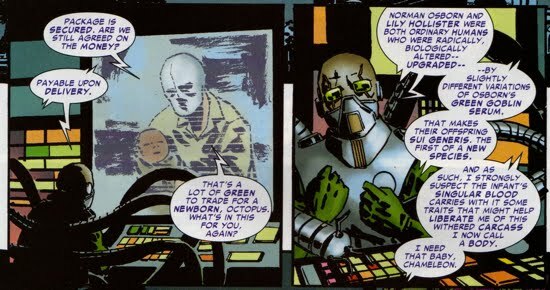 Doc Ock's rationale behind the plot to steal Norman's child was based on the fact that Norman and Lily were both altered (genetically) by some variant of the infamous Goblin Formula. Thus their shared offspring would be an extraordinary biological progression (a new species, sui generis). But as the tests by both Spider-Man and the Lizard demonstrated, there was nothing genetically special about the child. This, supposedly, proved that Norman was not the father. But did we all forget that Harry was also exposed to the Green Goblin Formula as well?? I mean, it was the reason that he originally 'died', wasn't it?? 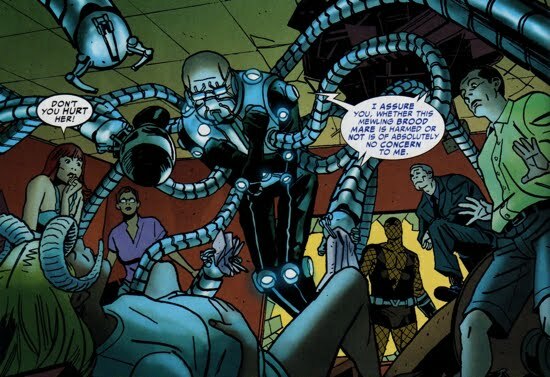 Doc Ock gathers Spider-Man's rogues gallery to track down the Osborn offspring, as seen in Amazing Spider-Man #642. 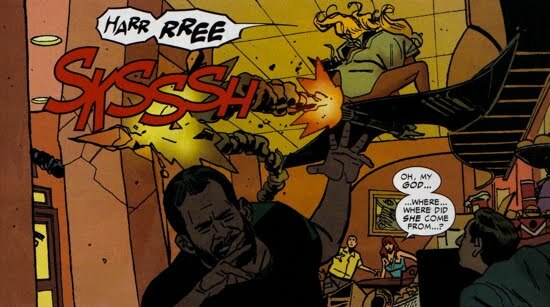 Lily Hollister, about to give birth, comes careening into the Coffee Bean in search Harry Osborn, as seen in Amazing Spider-Man #642. Carlie Cooper turns her back on her 'sister' Lily, as seen in Amazing Spider-Man #643. 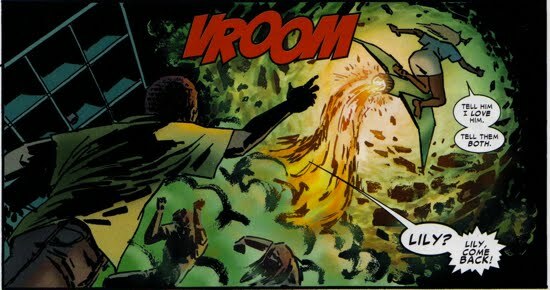 Homeland Security agents intervene, stressing the danger associated with Norman Osborn, as seen in Amazing Spider-Man #643. Harry considers using his Green Goblin alter ego to fight Doc Ock, as seen in Amazing Spider-Man #645. The Lizard shares his true feelings toward Norman Osborn, as seen in Amazing Spider-Man #646. Spidey tests to see if the baby belongs to Norman Osborn, as seen in Amazing Spider-Man #646. Lily decides that her life is too dangerous to raise a child safely, as seen in Amazing Spider-Man #646. 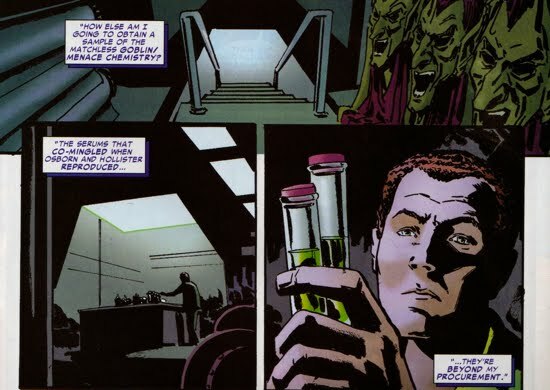 Spidey confirms (at the Avengers Tower lab) that Harry Osborn was the true father, as seen in Amazing Spider-Man #646. 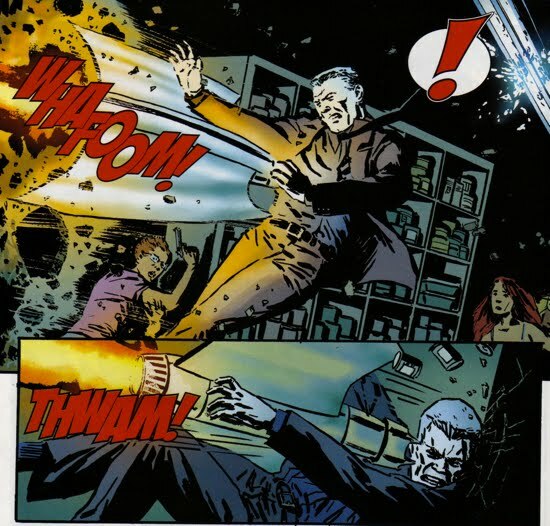 Harry accepts the reality that he is Stanley's father, as seen in Amazing Spider-Man #646.